In a large skillet over medium high heat, brown the ground beef. Drain the grease and add in the onions and bell pepper. 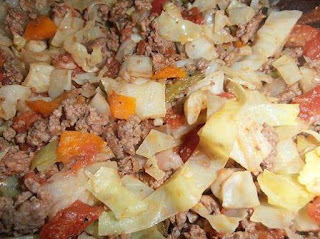 Cook for a couple of minutes and then stir in the tomatoes with juice, bullion cube, spices and cabbage. Reduce heat to medium, cover and cook for 25 minutes, stirring occasionally.